1. Do your food shopping at your local farmers market, rather than a chain store. These grown holiday fixings are generally better for you, and you support local farmers with your purchase. Also consider getting a free-range turkey this holiday, as these birds haven’t been raised in cages. 2. 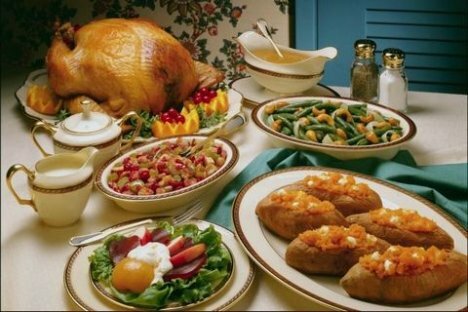 When it may be customary on Thanksgiving for everyone to stuff their faces and feast in celebration, most families make too much food. While some holiday leftovers are still tasty weeks after the event, many side dishes and fixings wind up stuffed at the back of the frig collecting mold. This year, don’t make so much food. Prepare plenty for your family and guests, but hold back from the standard 3 serving per guest . 3. Why spend time and money buying new fall decorations when you can easily craft your own at home? There are countless fall art projects on the internet, many of which can be done with the help of your friends and family. Instead of shopping for fall wraths and center pieces, spend some time at home with loved ones making new decorations. 4. Take means to downsize the garbage your household generates this holiday. It’s as easy as choosing washable plates rather than paper ones, tuber-ware rather than plastic wrap, or cloth napkins rather than paper napkins. Purchase fixings that contain the least amount of wrapping or plastic coating available (and remember to carry your own grocery bags to the store with you!). When the feasting is over, don’t just toss your scraps and leftover bits into the garbage, use them start a compost pile for your backyard. 5. There’s no need to stop with Thanksgiving, why not try to green Christmas, Hanukah, Easter, and all other holidays as well? In fact, why not use the tips offered here in your everyday life! Living a green existence is painless with the right perspective and attitude. Keep crafting, and buy handmade this holiday season!